Ella Rhodes reports on an innovative collaboration. What makes babies laugh? What makes them spontaneously break into dance? 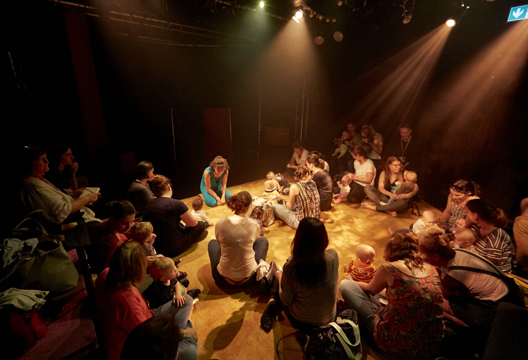 Psychologists at Birkbeck, University of London’s Babylab have helped the director of new theatre production, made especially for babies aged between six and 18 months, answer these questions and more in a truly collaborative project. Shake Rattle and Roll is one of several plays being premiered at London’s Polka Theatre and the Brit School as part of their Brain Waves festival. Its programme of events also includes an aerial show Depths of My Mind which is based on recent research on the development of the teenage brain, as well as Animating the Brain which has been developed with help from neuroscientists from King’s College London, puppeteers and filmmakers. We spoke to Sarah Argent, Director of Shake, Rattle and Roll along with Caspar Addyman (Goldsmiths University of London and formerly of Birkbeck). He’s one of three academics from the Babylab who has helped the theatre’s creative team throughout production. Also on hand to advise were Sinead Rocha, a PhD student whose research looks at how babies learn to dance and Rosy Edey, a PhD student looking at biological motion perception and social difficulties in people with autism. Argent has been working to create theatre experiences for babies since 2007: her first show Out of the Blue has toured for eight years and had performances as far afield as the Sydney Opera House. Peter Glanville, artistic director of Polka, asked her to collaborate with neuroscientists on a new piece for the Brain Waves Festival – she admitted she was slightly terrified at the prospect. This first trip to the Babylab became inspiration for the play itself – a single performer, Maisie Whitehead, takes the babies through a metaphorical trip to the lab, with all of its novelty, unexpected lights, toys and music. Addyman, Rocha and Edey were on hand to give advice on what makes babies laugh, what music is most likely to make babies spontaneously dance and how they read emotion in body language and objects. Dr Addyman, despite having now left Birkbeck’s Babylab, was asked to come along to a meeting with Argent to tell her about some of his work. She and Associate Director for Early Years at Polka Jo Belloli honed in on the projects of Addyman, Rocha and Edey. All three went along to Polka Theatre in Wimbledon to tell the creative team what might work onstage, based on their research. The Brain Waves Festival runs until Saturday 2 October in Wimbledon’s Polka Theatre and the Brit Theatre in Croydon.